Florida Commissioner of Agriculture Adam Putnam (right) discusses fruit fly eradication plans with Charles LaPradd, Agriculture Manager for Miami-Dade near the USDA ARS Subtropical Horticultural Research Station, on Tuesday, June 5, 2018. 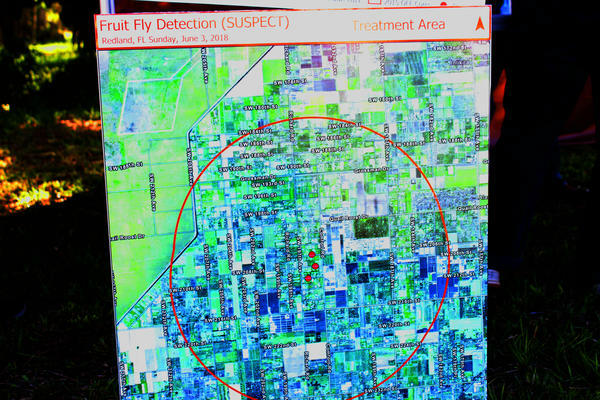 The 1.5-square-mile radius where treatment to eradicate Oriental Fruit Flies will be conducted on Tuesday, June 5, 2018. This species is considered one fo the most serious of the world's fruit fly pests because of it's potential economic damage. The Florida Department of Agriculture and Consumer Services confirmed it found three invasive Oriental Fruit flies in farmlands south of Miami-Dade County. This species is labeled one of the most serious fruit fly pests in the world and lays eggs in host fruits. 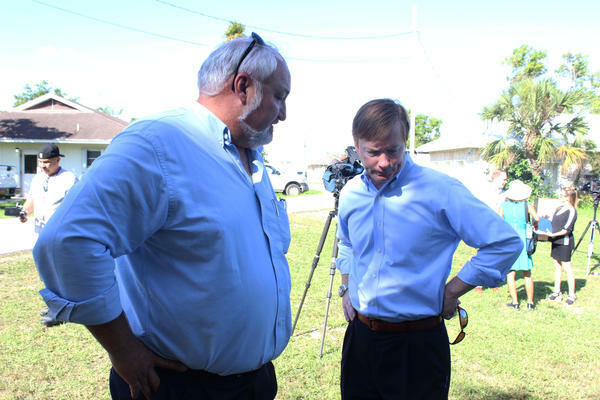 “Unfortunately, the state of Florida is a magnet for pests and disease because of our subtropical climate and the international travel that takes place in and out of our state,” said Agriculture Commissioner Adam Putnam during a visit to the area on Tuesday. Oriental flies feast on over 400 different fruits, including some of the most valuable tropical fruits in the Florida economy like citrus, mango, peach, plum, apple, fig, guava, avocado and banana. With a $2 billion dollar tropical fruit industry across south Florida counties, state authorities and the U.S. Department of Agriculture are attacking the insects before they spread and cause real damage. To eradicate potential female flies and larvae, treatment is being conducted in a 1.5-square-mile area around where the first male flies were found in Miami-Dade. This process includes attracting them to a trap laced with an attractant mixed with insecticide. The flies are killed when they feed on the bait. This mixture will be applied every other week to utility poles, trees and inanimate objects for two Oriental fruit fly life cycles, or approximately 60 days. Putnam said it’s too early to draw drastic conclusions like the need for a quarantine. Julio Rodriguez, an assistant for the Florida Division of Plant Industry, said that during the eradication process the traps will be checked every day. There are about 56,000 traps in Florida monitoring for pests like the Oriental fruit fly and over 1,300 traps in Miami-Dade alone. Oriental fruit fly was last identified in South Florida on August, 26 2015. The area was quarantined and Putnam declared the area free of the pest in less than 6 months.